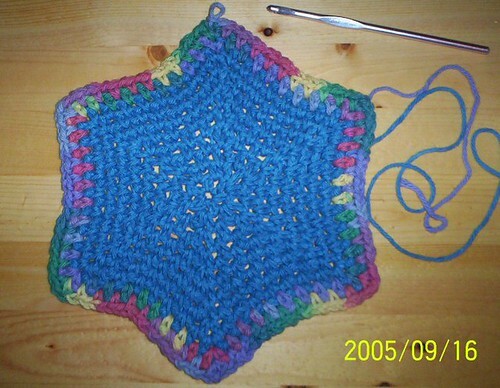 In September 2005, someone posted a request for help figuring out a crocheted hexagon. I was intrigued, and had a try at it. I think I figured it out. I liked the motif well enough to use it as one of my images, and in July 2006, I got a question about it. Since the instructions that I had given the original poster were screened when crochet went inactive, I am repeating them here. Basically, the corners are two sc in a ch1 space, and everything else is 1 sc in a ch1 space, and every sc is separated by ch1. I used Lily Sugar'n Cream (Delft Blue and Rainbow Bright), and an H8/5mm hook. I tend to crochet tightly, so I made a conscious effort to crochet loosely. From side to side, the motif measures 7.25"/18cm, and from point to point, it's about 8.75"/22.5cm. Nine rounds of the main color, then 2 rounds of the contrasting color. That is so awesome and I'm going to bookmark it, thank you! But yes, the concave curves of the edges do give it a soft Star of David look. I think the edges would straighten out if multiple motifs were sewn together, but as a stand-alone... Yes, it is a soft, six-pointed star. OH MY GOD! thank u thank u thank u! tis gorgeous! i am in LOVE!!!!!!!!!!!!!!! i will have to go through ur journal and find more stuff! cause your explanation here was so easy!